Keep calm and let CENTURION’s robust speed bumps keep traffic calm for you! Our high-quality, highly robust traffic calming bumps will stop any aspiring Formula 1 drivers from turning your parking area into a raceway and endangering others in the process. Made from a rock-solid rubber compound and available in black and yellow, CENTURION speed bumps make for smooth, noiseless passage under low speeds and increases in rigidity under higher, dangerous speeds for effective traffic calming. The speed bumps are available in lengths of 0.5m and are outfitted with reflectors for excellent visibility. While each tyre track may tell a story, some tale of a journey started or a journey concluded, your speed bumps won’t be marred by cracks and discolouration. CENTURION speed bumps are built strong to last long and endure even the heaviest traffic volumes. 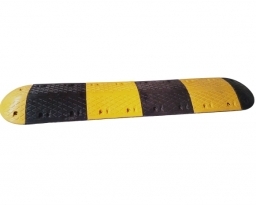 CENTURION speed bumps are available in black and traffic yellow and are fitted with reflectors (‘cats’ eyes) for excellent visibility by day and at night. Simply loosen the rawlbolts and fit in the desired location.